m made the January 25th announcement about her presidential run, she decided to enter the Florida Presidential primary. She had little money, budgeting less than $10,000 (unheard of today), and little organization. She relied on volunteer support from young people and the women’s movement. Her greatest opposition came from more established African American male elected officials. On the campaign trail she walked on striking unionists picket lines, spoke her fluent Spanish in all the Spanish speaking districts, campaigned in colleges, churches and community centers. Unlike today’s candidates, she did not pander. 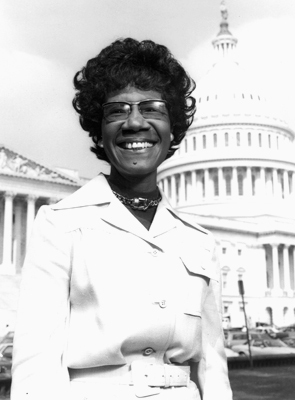 For more information on Chisholm's political career, please visit her profile for Black Americans in Congress.